There is a Mellow Mushroom that opened up not long ago in nearby Burlington. I've yet to eat at that one but now I'm feeling led to. For one thing the pizza is insanely delicious. For another, after reading this next story y'all will agree: this company rocks! The tale begins with Army National Guard Major Shawn Fulker, who lives in Jacksonville, Florida. At the moment Fulker is deployed thousands of miles from home in Afghanistan. His wife's birthday was coming up and in spite of the distance he wanted to do something nice for her. Josephine Fulker really loves the pizza at Mellow Mushroom, so Shawn e-mailed the company's corporate office and asked if one of their Jacksonville restaurants could deliver a pizza and a $50 gift card to his wife. Shawn let them know that he would gladly call the store and pay for it by credit card. Mellow Mushroom's headquarters forwarded the e-mail to the company's Fleming Island location, which went above and beyond the call of duty. 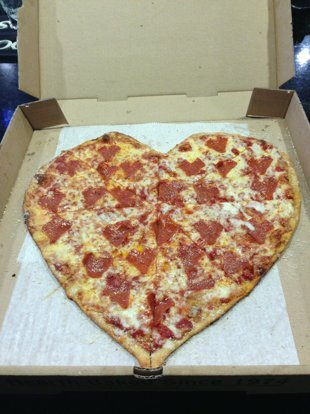 First they made a special heart-shaped crust for the pizza. Then the store manager and another employee drove out with it, stopped at a supermarket to buy balloons and a vase of flowers, and proceeded on to the Fulker home. They delivered it all - including the $50 gift card - to Josephine. John Valentino, the Mellow Mushroom franchisee who owns that location and others in Jacksonville, said his store was happy to have made the day special for the couple. "Of course we weren't going to charge him for anything," Valentino told ABC. "Him being a serviceman and his wife being home. … Hopefully in her husband's absence we were able to help her have a great birthday while he's over in Afghanistan serving our country." Josephine Fulker had just finished Skyping with her husband when the doorbell rang and she saw the two Mellow Mushroom employees at her door on Thursday. "I don't know their names exactly, but they had a pizza and a big butterfly balloon and a vase of flowers with a gift card for $50 and they told me that it was from my husband. I said 'Oh my goodness.' I was surprised and excited and overwhelmed and all of that. It was so nice," she said. It was especially nice because Shawn Fulker had already sent his wife flowers and candy earlier that day. Since he hadn't been able to check his email for a while, he had no idea that Mellow Mushroom had been working on his initial request. 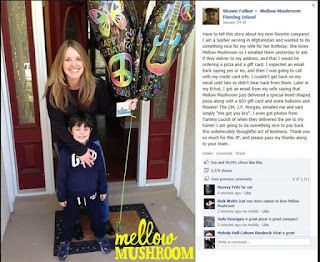 The Facebook page for Mellow Mushroom at Fleming Island has gone bonkers with gratitude about their efforts for the Fulkers. Which was a very, very cool thing to have done. And hey, Fulker and his unit also showed their thanks, all the way from Afghanistan!